In August of 2010, the enterprising hackers at Unstable Apps created the program Easy Root. After a single day in the Android Market, the app was pulled by Google. Luckily, the open nature of the Android OS, the developers at Unstable Apps are able to sell the app from their website. If you go to their website, you can purchase the Easy Root app with Paypal as cheaply as $0.99. Once purchased, make sure you give permission to Unknown sources in the Applications under Settings. Down the file via the link emailed and run the apk to install Easy Root. Once installed, click the Root button and restart your phone to be fully rooted. Why root your phone? Good question, and one often asked. For me, there are two main reasons. The ability to screen capture and the ability to use my phone as a wifi hotspot for free. Screencap Once the phone is rooted, you can click the button for drocap or download it directly from the Android Market. Once installed, you can run the drocap app to take a screen capture when you shake your phone or to run down a timer. A simple feature built into the iPhone now accessible from the Droid. Wifi Tethering Froyo introduced turning your phone into a wifi hotspot with Android 2.2, but only for certain phones and with a plan from your phone provider. Once the phone is rooted, there are two main wifi choices to choose from. 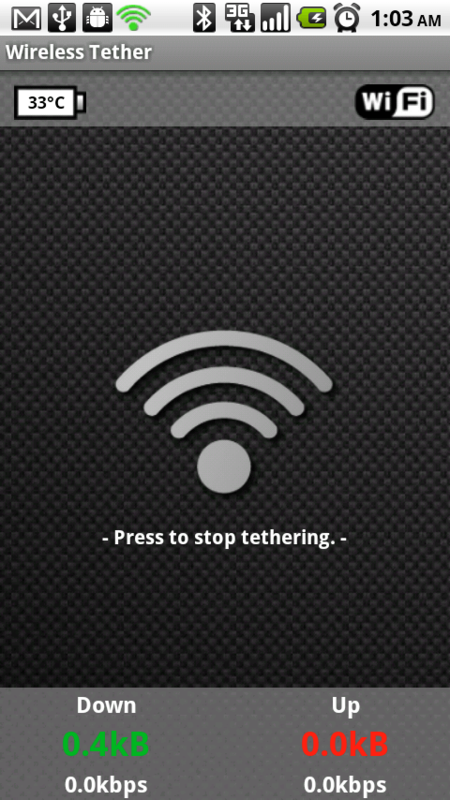 Wireless Tether For Root Users (available through the Android Marketplace when clicking the Wifi Tether button in Easy Root) is considered the best tethering app and lets you connect via wifi or bluetooth to the internet via your phone. If you get the “no netfilter! sorry, but your kernel does not have all necessary features for running this application” error when running it, you can use Barnacle Wifi Tether instead, which will also let you connect to the phone via wifi only. Simple rooting of the Droid easily made it worth the 99 cents spent to give access to the wifi tethering and screen capping. The latter should be built into Android and the former is very convenient for traveling with an iPad that does not have the 3G capability. The Maker Credo says you bought it, you own it and you should use it in the ways that you want to.